The Cam IQ relies on Google's FaceNet technology, and will automatically log new faces in the Nest iOS app. People can then be tagged as friends or family, and with a Nest Aware subscription, users can customize alerts so that only unknown faces trigger them. Another added Aware perk is "intelligent audio alerts," which happen if a camera picks up unexpected sound. Aware normally provides 10 or 30 days of cloud storage, person recognition, and "Activity Zones" for special alerts, such as around a crib. Although the camera shoots in 4K, it only outputs in 1080p. The extra resolution becomes essential with "Supersight," which digitally zooms in on motion in the Nest app while retaining 1080p quality. A picture-in-picture view of the whole image keeps playing in the corner. 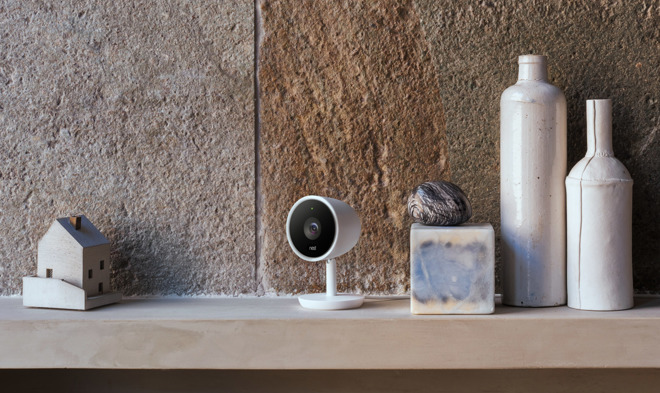 A six-core processor allows the Cam IQ to detect people on-device, instead of only through Aware, as with other Nest cameras. The company has also installed 802.11ac Wi-Fi, two new infrared LEDs for improved night vision, and three new microphones for better reception and noise/echo suppression. A louder speaker has been added for two-way communication, though people will have to wait a few weeks after launch for continuous talk instead of an initial push-to-talk method. The Cam IQ should ship towards the end of June for $299. A Nest Aware subcription costs $10 per month or $100 per year for 10 days of storage —upgrading to 30 days costs $30 per month or $300 per year.